Making your way around the streets of Las Peñitas, Nicaragua, is no easy task, and it only gets more difficult as you walk up the rocky, washed-out dirt paths into the fishing village where Fuller Center for Housing volunteers are helping hard-working families build simple, decent homes. As hard as it is for volunteers to traverse those village trails that can only loosely be described as roads, it is even more difficult for Quell Jenkins. 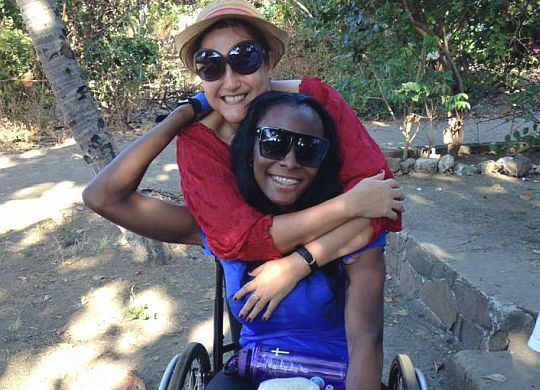 The 23-year-old is confined to a wheelchair. 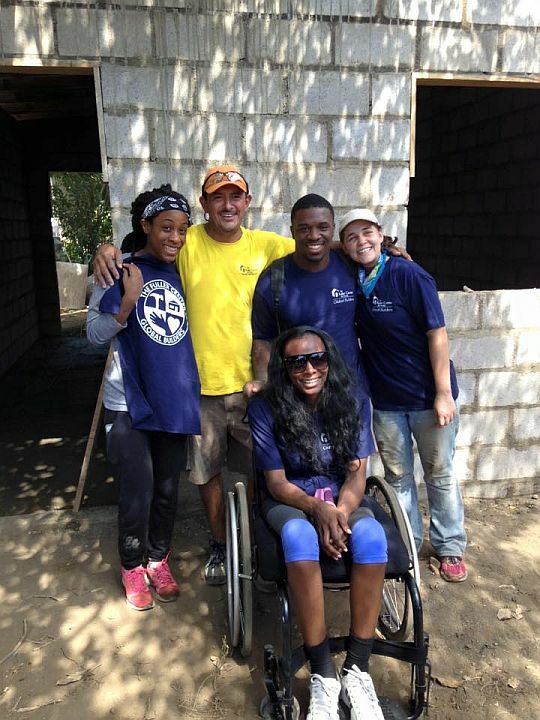 But those who know Quell Jenkins were not surprised to see her volunteer to help build homes for those in need — nor were they shocked to see how hard she worked on the job site or how much inspiration she brought to every person she met along the way last month. What Jenkins saw on those roads of Las Peñitas pales in comparison to what she has witnessed — and overcome — on the streets of New Orleans. “I feel like God has helped me overcome a lot in my life,” the Ponchatoula, La., resident said. What does she mean by “a lot”? Jenkins’ father died a few days before her second birthday. Her mother’s life was consumed by drugs. She grew up on the streets of New Orleans, in the projects and in the homes of various relatives. When she was 12, Hurricane Katrina struck and she lived a couple of months in California. As a teen, she joined a gang with some friends who lived in her housing project. Finally, she left the gang, got back into her grandmother’s church and recommitted herself to her schoolwork. Then, at 17, she got into an argument with an ex-boyfriend. The young man shot her three times, leaving her paralyzed. She got out of the hospital three months before graduation, and the school allowed her to catch up on her studies and receive her diploma. But she was in a dark place. Her sister invited her to join her church, First Baptist Church of New Orleans, in an effort to lift her spirits. There, she made friends who were full of joy and committed to serving others. Jenkins saw their Christian service as the power behind their enthusiasm for life. She began studying scriptures, was saved, and joined a church ministry to help the homeless of New Orleans. It was while feeding the homeless that she met Mike Chance, who was a pastor in New Jersey at the time. After the Chance family moved back to Ponchatoula, La., where Mike is a senior adult pastor at First Baptist Church, they welcomed then 19-year-old Quell into their family. She calls Linda and MIke Chance “Mom” and “Dad” and now has a brother and two sisters. But it was a new aunt in nearby Hammond, La. — Tamara Chance Danel — who inspired Jenkins to work in Nicaragua. Quell Jenkins sifts sand in Las Peñitas. Danel, who leads the Ginger Ford Northshore Fuller Center in Hammond, La., held a local meeting to encourage people to join her on a Fuller Center Global Builders trip to Nicaragua. In rolled Jenkins, along with three friends — Sara Rehm, Zoia Carr and Reggie Taylor, all of whom wanted to help the families of Las Peñitas. 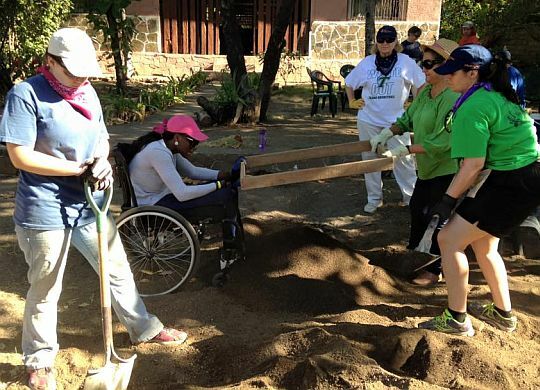 Jenkins developed strong relationships with the group’s homeowner partner in Nicaragua — Lourdes — as well as with fellow team members, other residents of Las Peñitas and with the staff of the local Fuller Center that made sure Jenkins could fully participate in the weeklong project. Fuller Center experiences ultimately are more about people than about houses, and Jenkins found that to be especially true in Las Peñitas. Alberto Maradiaga, a staffer with the local Fuller Center managing the Las Peñitas project, was so inspired by witnessing Jenkins’ efforts that her departure brought him to tears. Quell Jenkins with friends Zoia Carr, Alberto Maradiaga, Reggie Taylor and Sara Rehm in Las Peñitas. Jenkins now reads Bible passages every day, and she encourages others to do the same. That effort has developed into a ministry in which she and her friend Sara raise money to buy Bibles and give them to those without. Her thirst for the Bible was reinforced by a relationship she struck up with a Rastafarian during a mission trip to New York City last year. The Rastafarian was impressed with the way Jenkins clung to and constantly referred to a pink Bible she had received from her friend Lydia when she was saved in New Orleans. Today, Jenkins continues to give away Bibles but on a larger scale. She has launched a Go Fund Me campaign to help her raise money for her mission. “When I started reading the Bible every day, it just changed my life,” said Jenkins, who added that she wants everyone to know that same feeling. “This girl is somebody to watch,” Danel said. Make a donation in Quell Jenkins’ honor.